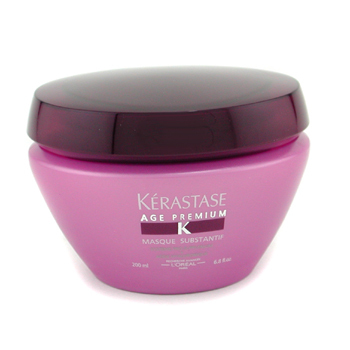 Age Premium Masque Substantif, a moisturising and nourishing masque that works wonders on mature hair and scalps. Hair is left revitalised and feeling denser. Kérastase Age Premium Masque Substantif combats the signs of mature hair ageing by protecting and supplementing your hair and hydrating your scalp. Using Systeme Pro-Supplenium and hyaluronic acid technology, calcium derivative offers the support of a mineral essential; vitamin F derivative provides much needed energy to the root and substance to the fibre whilst ceramide helps to repair the cuticle. With pomegranate extract acting as an anti-oxidant, a UV filter to protect against the suns rays and hyaluronic acid to rebalance and hydrate, your hair and scalp feel thoroughly revitalised.